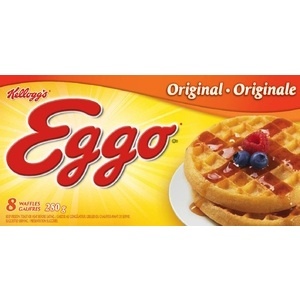 On Checkout 51’s list this week (Sept 12-18, 2013) is Eggo Waffles and Eggo Mini Waffles, 8 count (224g – 280g), any variety. Eggo Waffles are crispy on the outside, light and fluffy on the inside, Eggo* waffles can go from the freezer to your fork in a matter of minutes. As a source of 9 essential vitamins and minerals, Eggo* waffles together with fruit and a glass of milk provide a complete and balanced breakfast. 8 waffles per 280g carton. The best way to enjoy an Eggo* waffle, is your way! Top it with syrup, berries, fruit, etc. The options are endless, and the fun is up to you. You will get $1.00 cashback rebate at Checkout 51. Here’s a pic of what it looks like. I found a couple prices of it at a few stores. I didn’t find any Eggo Waffles coupons to use. Checkout51 offer expires midnight Wednesday Sept 18, 2013. You must purchase in Canada and upload your receipt between Thurs Sept 12-18, 2013 to qualify for the cash back rebate. Check out here for more Checkout 51 cash rebates for this week.